As the weeks go by, they just seem to pick up speed. Wasn’t it just a couple of weeks ago that we were talking about Memorial Day and the start of summer? And now we’re already seeing back to school fashions and Halloween candy in the stores. Where did the time go? 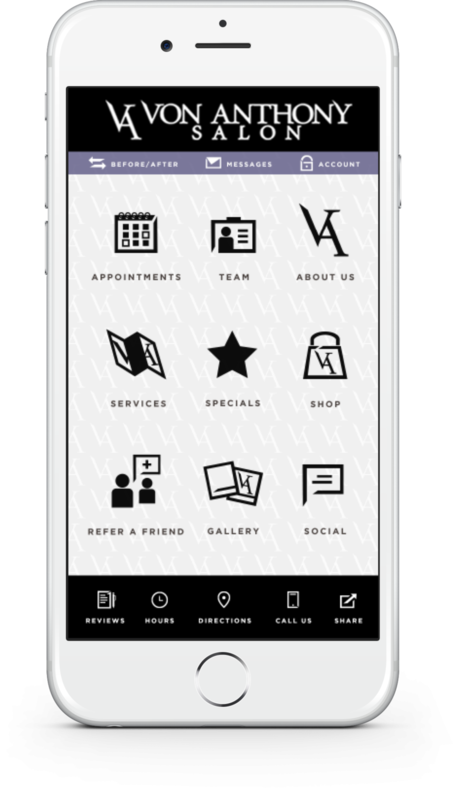 Here at Von Anthony Salon, we have a sure fire way to help you save a little more of your precious time with our free salon mobile app. When you want to make an appointment, our mobile app makes it quick and easy to get exactly what you want. Browse our full line of salon services, and then select the day and time that work best for you. As soon as we can confirm your new appointment, we’ll let you know right through the app. No need to make any calls – it’s the ultimate in multitasking tools. But there’s lots more you can do with this miracle tool than just make your next appointment. Shop our full line of products right through the app, and keep up with our latest specials and promotions. Follow us on social media and learn more about the great people who make up our team. Sign up to receive our email newsletter and refer a friend. You can even purchase a gift card redeemable for products or services right through the app, and we’ll send it out to the recipient of your choice. It’s like having your own personal beauty assistant right in the palm of your hand. Take charge and make your calendar slow down for you with the Von Anthony Salon mobile app. Download it for free from iTunes, Google Play, or Amazon. Got a little extra time on your hands? We’re always happy to speak with you in person, too. Call us at 972.731.7600 to schedule your appointment or stop by to see us at 7004 Lebanon Road, Suite 102 in Frisco. Remember, it’s not impossible but I’m possible!